When the mountain is the only thing that really matters. 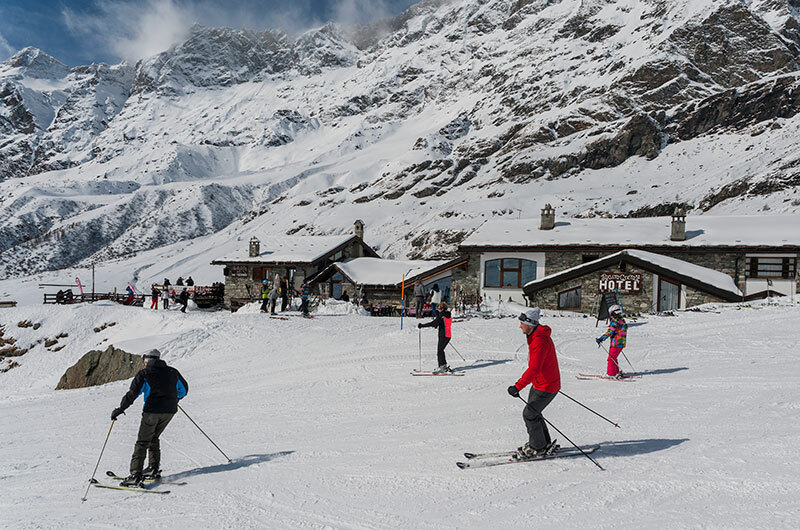 Cervinia is the only ski resort in Italy where you can ski almost all year round. You know that perfectly and that is why you have chosen these peaks. Or maybe it’s them peaks choosing you! 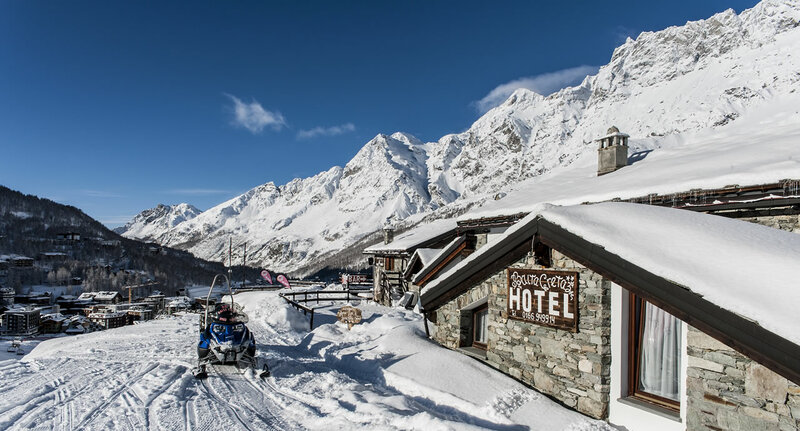 Of course you know that you cannot do without it and that anytime is a good time to reach us and enjoy YOUR own Cervinia. Choosing the Cottage is choosing a lifestyle. For full living the mountain like it’s your second home, you who feel comfortable only with skis at your feet; for you who find peace in the silence of the snow-capped high altitude peaks surrounded by almost surreal scenarios. 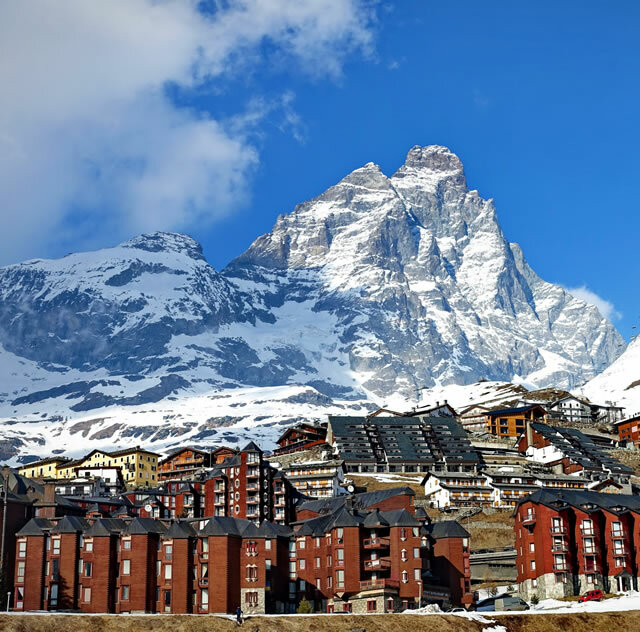 For you who open your heart to emotions, especially in the early morning, when the Matterhorn has a very special light and in the evening, viewing the enlightened valley at sun set. 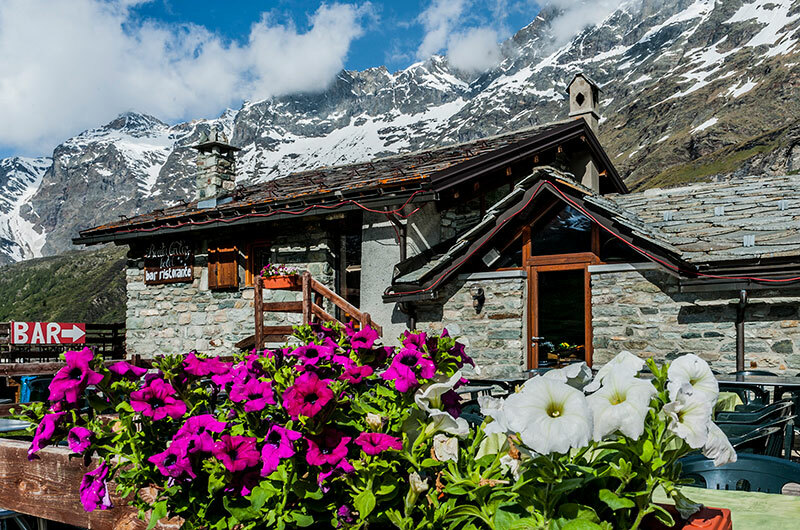 The Cottage is also for you who wake up early in the morning at summer time to enjoy the walks along the large green outcrops, then return “home” with a precious gift, images of spectacular views fixed in your mind, images that the Matterhorn donate to those who love it. You walk out of the hotel and you are right on the ski slopes. It is not just a way to say, but it is really so, because track n. 5 goes right on the Cottage side. 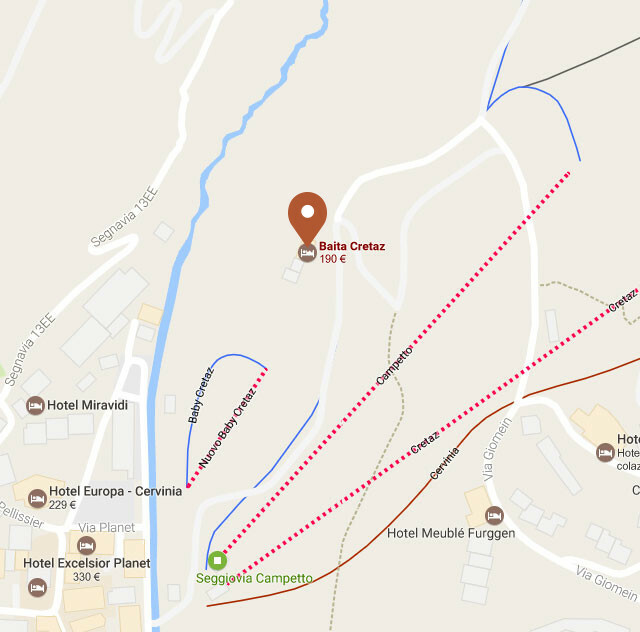 For this reason, we have three entrances, one reserved for the restaurant, another one from the bar terrace that gives you access on foot right to the bar counter and the third stone paved one for hotel guests who can enter and leave comfortably while wearing boots. In the morning, you can leave so quickly! After a rich breakfast, you can leave your slippers in the ski shoe room, wear your boots (pleasantly warm, thanks to the heated wall), open the door and you are right on the ski slopes! And in the evening when you finish your sport day and want to rest and warm yourself up by the fire, just get in, take about 10 steps to reach the ski room, leave the equipment and make yourself comfortable in the living room where the fire place is and right near to your own room. The burning fire place, the soft lights, the comfortable sofas and the paintings on the wooden walls, the good smell, which knows how to welcome you, will allow you to immediately breathe an intimate, familiar atmosphere and you will sure want to take your place, gather in front of the fire place, maybe accompanied by a good book. You can sit together with your friends at the table, play cards and have a chat, telling each other about the most curious anecdotes of the day. 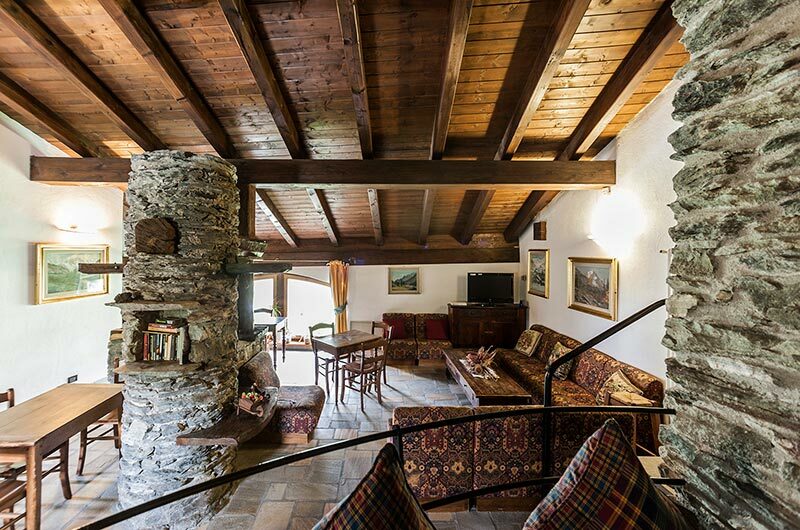 To embellish the warm living room there is a small library that rests on an old stone of the eighteenth century, where women cooked milk to produce the typical mountain cheese. Traces of an ancient past when the Cottage was a simple stall, which we show to our guests with pride. There is no space for technology here. There is only space for human relations. We love animals, as we love our Gina, a sweet and tender little dog that accompanies us in each moment of the day. We are so close to the slopes that in winter your 4-legged friend would not live in freedom and wide spaces, how it is supposed to be, but would have to spend many hours indoor without you. 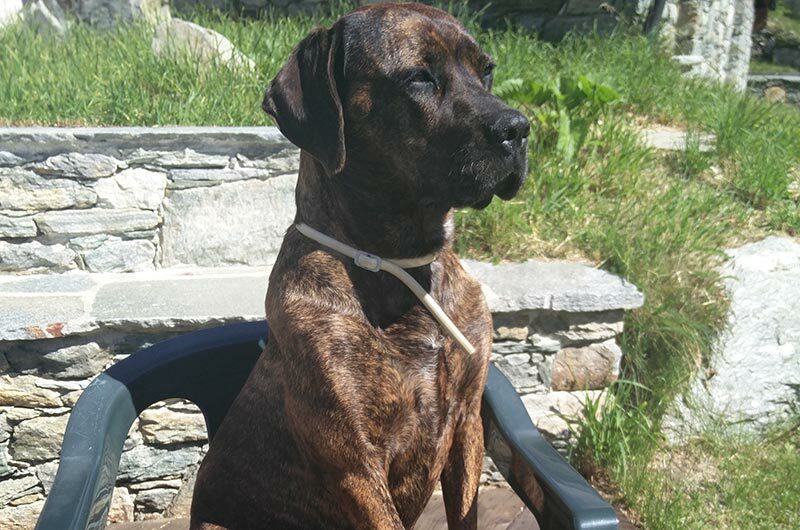 That is why we preferred to welcome your loyal friend only during summer, when he can run around playfully in the big green valleys or follow you in your high altitude hikes. He will be our guest free of charge, because as we said, we really love animals.